It's the end of the year, practically, and I'm in a horrible mood. My dream of home ownership for 2010 is unattainable, and I don't feel that things are promising for 2011. Typical me, I want to blame someone for this. When I'm angry or hurt or slighted, I must direct my emotions to someone. I feel better doing this. The person solely receiving all the blame this time is my realtor. Around the time of my birthday, the middle of December, the promise of closing on a house fell apart. On that day, my birthday, my realtor called me and told me to contact my mortgage broker because I had to close before the end of the year. So, on December 13, with approximately 12 working days left until the end of the year, I had to get my loan originated, underwritten, approved, and closed. I told my realtor this was nearly impossible. My sweater wrap is off the needles but it needs to be blocked. 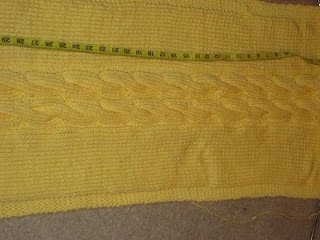 What worries me a bit is there appears to be some pulled stitches and I don't know if blocking will take care of that. I bought mats and pins for blocking, so I'm really going to try to do this correctly. This means I'll be back on the Internet, researching blocking procedures. I think I'll go to the store and get some Wool-lite because I'm hoping that will fix the problems with the pulled stitches.